Cool demo Optimus! Great to see another one in a mixture of C and assembly language :). Great little demo Optimus!! Effects & colours are very nice. Well done..
a little long but still good. I think it can be yet be done faster. It is a piggy for you for one reason: WHY DO YOU STILL RELEASE YOUR PRODS IN A SUCH BAD WAY! I didn't found it relevant (maybe the CPC scene does?). Great demos are released on PC and all the files are there. Does it make any demo worse? That makes me remember that a good demonstration is about pushing the limits. And that's what you've done here. So it's a double thumb up for me. Well done Optimus... Great old Wolf effect (: I like it ! Looks and sounds very impressive. There's a minor glitch on the left and right screen border, which is - i assume - why you mostly have scenes where the camera only rotates but does not move. But that doesn't spoil the impressiveness one single bit. Damn, that cheered up my Sunday morning! Good surprise to watch it ! FX as texture are excellent idea. I also enjoyed camera's movements (not that easy to setup). As Krusty pointed out, multiple files in directory gives slow loading and also gives me the feel that the demo is unpolished, which is sad. Good job to everyone involved in this production ! @norecess: we improved this, by adding a simple CATart in the latest version! We are sorry that we didn't think of it before uploading the very first version, but we tried to correct it! Please d/l the latest version. Pretty awesome, my favourite aspect is the scrolling text on the walls. Is there a technical reason as to why there is a slight fisheye distortion? @fizzer: I do apply for fisheye distortion but it's just not perfect. I am not sure why. And, there is a process which might make it loose more precision and one can see the walls are not perfectly straight when looking directly vertically at them but there are little inaccuracies, which is something I am willing to research further when I use this engine for a future project (game probably). Nice production, good graphics and strong code ! I find the music a little bit strange, but just heared it on a emulator at the moment. I don't agree with Krusty saying it needed a cart'art. If your prod does not fill a whole disk, why doing a cart'art... You just should have linked the prod in one or two files , that would have been cleaner :-). Vexing pace, music and colors. Admirable! It was a great idea to "write" effects on the walls. 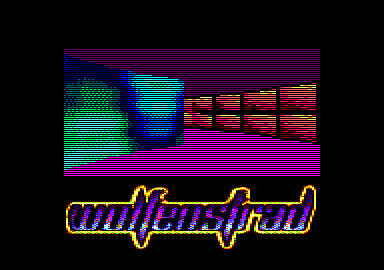 :) Yes, I remember various Wolfenstein engines for Spectrum and many of them had something moving on the walls but this idea is better and original... I like the tune, too. Optimus: It looks a bit like you are offsetting the rays by the cosine of the ray angle in order to counter the fisheye effect. Do you have a regular step in angle between pixel columns? If so, this is incorrect. You should be either using the tangent of the ray angle or a linear transform.... Probably difficult on the ZX! Any it's cool for people not using real floppies. The original argument was about hiding the data files. It wasn't about the number of files. Now, the argument has transfered to this and I don't even understand why. The thing is, it would be worthy to argue about this if I had for example 8 or 10 small files and the loading was really long, but I think I have packed most of the stuff in quite a fewer numer of files. There is a big file with code and data packed together in 24kb iirc (the maximum possible might be 32kb I think) and a loader file (wolf.bin) with some more data packed together that it was easier to fit there but they are together and not scattered in separate files, and only the two runseq 10kb each files that maybe could be fused together in a single one but it was easier this way the way I relocated stuff in extra memory in the loader. But this is what I have, it's one big code-data file, two additional data-files and the loader packed with other remaining data of last resort. I thought structure-wise the files were quite ok. I had 4, it could be at best 3 and things are quite fused together. The thing is that this discussion has started with Krusty's mention of not hiding my files and went on to the claim that my file structure is horrible which is not the case and it would never happened we had the catart in the very first beggining and hell knows what I would find if I had seen the contents of other popular CPC demos with a viewer. I am not sad about it, I am just puzzled. If I released the same demo on the C64 nobody would care about these things. Yep, that's exactly what I did I think, what you say in the first sentence. Another possible reason was, the pixel resolution has twice wide pixel, then my column renderer draws a byte which is two pixels packed, and when I tried the cosine method from my PC raytracer I got a wrong result, maybe because I have to compensate for the ratio? (though, I am not sure). So then I compensated by multiplying a factor x2 to the cosine fishbowl correction data which also still didn't made it and found a value that was almost good. Your other suggestions are interesting too, thanks! Very good frame rate. I can remember some old Amiga 500 demos with wolf3d slower engine that this one. Cat Art or file struct is an irrelevant debate for me when there are important technical achievements here. Raycasting + textures on CPC = thumb up! However, I didn't like the music that much. @Optimus: Yes, I said at least, without explaining what would be better. Voxfreax never say that to you that the disc is a mess while working in the project ?! There are still people storing several demos per 3" discs. Good effects on the cubes. @Krusty: Sorry, I never realized you were talking about the file structure and not just the fact I didn't hide the catalogue. Though, I find the "crimes" I committed with files are not so extraordinary. Maybe we should discuss this in an email so that we don't polute this thread though. Wow unexpected new big release by our fellow Optimus! Great gfx and sound as well. (Voxfreax & Sice) Yes a new baby for the CPC to enjoy! I was going for a piggy, because while this is technically great, I got bored by watching it on the bigscreen rather quickly. But, the people bitching about catarts and hidden files made me smile, so here's a thumb. For CPC users storing multiple demos on the same dsik: don't you know of |user ? It's made just for that ! I'm going back and forth on this one. Good tech, but I'd have to say a bit boring and coder colors for no good reason. Using effects as textures is neat. Hm. Nope, I'm sticking with my gut feeling piggie. Just kidding. First, it's the best polished Dirty Mind's demo I saw, so nice progress on this side (Voxfreax work). The music is an old, but still good, Sice track. And I like the textured effects on the walls. The little drawback is the fishbowl effect and the "Y rotator only" when it's textured. But I still like the prod, thumb Optimus and all the team! Rather dull and ugly, but not awful. pretty cool, but it tends to get boring pretty quick. it needs a little more fresh tune than this one. still, here's my thumb. Cute ! Well polished... (funny effect on the walls). Wow, Optimus finallz made something out of his numerous effects he has lzing around! oops, z and y reversed.. I just uploaded a more compact version Grim send me. Thanks! Thumb-up for the technical side of things, but that apart it's very boring and way too long. Need some more speed in the movement and less ping ponging between two similar positions again and again. nice dynamic textures. good work pal. Very nice work. I want CPC!!! I just wish I knew the CPC better so I could appreciate this more. @knoeki: then learn more about it :) Feel free to roam around pushnpop.net and present yourself! rulez added on the 2012-03-22 10:47:08 by ɧ4ɾɗվ. Oh my, Optimus, you rule so badly! however, i sort of don't get the title; what is it supposed to mean? The choice of fonts isn't the best. It's hard to read the greetings. Yep, it's usual problem of texture mapping effects to not represent well the graphicians work. I think they will do fine for menu fonts in our game though, their fat style reminded me a little of Doom's options menu. Good to have some Greek CPC stuff. Starting out myself on a CPC 464 - this just blows me away.... amazing stuff!!! Best Technical Achievement on CPC for year 2012. Impressive coding as ever from Optimus!!! page created in 0.022893 seconds with 15 queries.